Padma Lakshmi was on hand for the 10th Annual Women in the World Summit at Lincoln Center in New York on yesterday(April 11th). 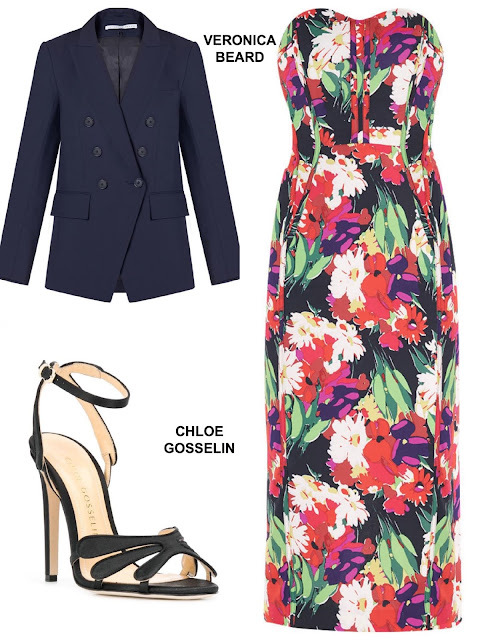 The 'Top Chef' host looked stylish and sophisticated wearing wearing a VERONICA BEARD SPRING 2019 ensemble featuring the 'Lonney Dickey' black blazer which was thrown over her shoulders and the 'Saffron' floral strapless dress. Beauty wise, she went with a vibrant red lip color and center part light waves, which topped off her look along with a gold necklace and the CHLOE GOSSELIN 'Clara' sandals. You can get Padma's Veronica Beard pieces via the brands website, the dress HERE & the blazer HERE and her Chloe Gosselin sandals at FARFETCH.